Home / news / streaming / Now Streaming: 'Castlevania','Archer', 'Nerdland' and More..
Now Streaming: 'Castlevania','Archer', 'Nerdland' and More.. Welcome to the new format of our Now Streaming feature! From now on, our guide to the latest animation additions to Netflix will be coming out much more regularly. This means that fewer titles will feature each time, but to make up for it, we'll also be going into more detail about some of the additions. Let us know what you think of the changes! 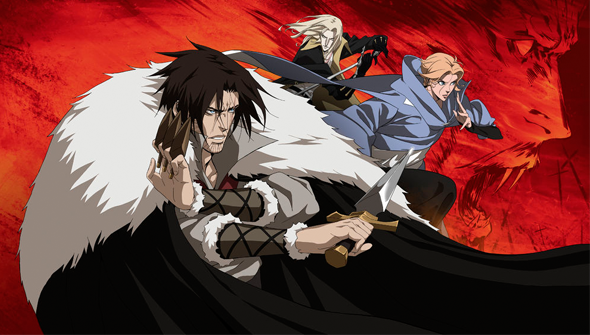 CASTLEVANIA Based on the classic Konami Videogame franchise, this new animated series from Frederator Studios and producer Adi Shankar follows a vampire hunter from the Belmont clan. ARCHER: SEASON 8 Subtitled Archer: Dreamland, the eighth season of Adam Reed's popular spy show takes a surprising turn, by relocating to a late 40's Film Noir style LA Setting. NERDLAND This adult animated feature from Titmouse Animation follows two nerd friends on a mission to become famous in 24 hours. Featuring the voices of Patton Oswalt, Paul Rudd, Riki Lindhome, Kate Micucci and Hannibal Buress. YO-KAI WATCH SEASON 1 The adaptation of the hit Level 5 videogame franchise is available in both Westernised English-language version and in the original subtitled version. EUREKA SEVEN Anime series featuring air-surfing giant robots, and a mysterious girl named Eureka. Created by the acclaimed Studio Bones. KINGSLAIVE: FINAL FANTASY XV: CG-animated prequel to the recently released Final Fantasy XV videogame from Square Enix. HEAVY METAL Classic adult sci-fi anthology flick from 1981 based on the legendary French comic of the same name. STORKS Warner Bros Animation comedy takes a modern day look at the legend that newborn babies are delivered by storks. PUSS IN BOOK: TRAPPED IN AN EPIC TALE Netflix and Dreamworks Animation present their first interactive story.